GRASSROOTS ICE HOCKEY During the 1990-91 season, 5,573 female ice hockey players registered with USA Hockey. 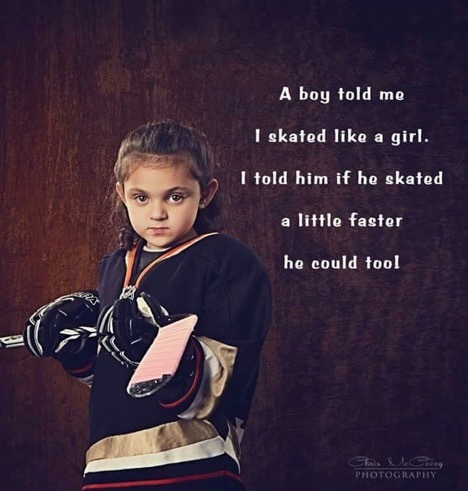 Since then, that number has increased more than 10 times with nearly 73,000 registered girls and women playing ice hockey across the United States today. While the number of girls’/women’s teams has grown significantly, some females continue to play on mixed-gender teams. Is the sport of hockey safe for my child? Yes. Hockey players wear more protective equipment than any other sport. A study has shown that ice hockey injuries ranked after both basketball and soccer in emergency room visits related to sport and recreational activities. Youth hockey places a strong emphasis on sportsmanship and friendly competition. There is no checking in youth hockey until the Bantam level (ages 13-14). Mite (6-8), Squirt (9-10) and Peewee (11-12) do not allow body checking, however some body contact is part of the game and will occur. Girls are allowed to play at the Bantam and Midget level with the boys if they wish. This is a judgement call for the player and the parents. If the checking is concerning, the best move would be to an all-girls program. Currently Waltham Youth Hockey offers girls-only programs for 10U (Squirt), 12U (Peewee) and 18U (Midget/High School). At the 10U and 12U levels, the majority of our girls will also play for their age-appropriate town travel team. In the past there has been an 8U team comprised of mite-aged girls and this is a future option depending the enrollment and interest for the upcoming season. The girls teams are a great addition to playing alongside the boys. In the past we have had girls-only nights where every girl in the program, from tykes to midgets, is invited to participate. We have had Waltham High School players and coaches run some practices and last year had Weston/Wayland come for a visit. We also serve pizza at the end of practice which gives the kids a chance to hang out and talk with their friends. We are looking to expand this program for the 2018-2019 season and plan on setting up some fun girls-only events. Additionally, the WHS team has sponsored a girls’ hockey night for the past couple of years where the players are invited into the locker room after the game, given a team poster and get to ask the players for autographs.